Since 1925, the H&H name has been touting the benefits of their .300 H&H magnum round. They have had good reason to as well. 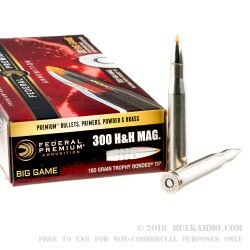 The performance is excellent, and it is the first .30 caliber Magnum introduced to the world. It set the stage for some very well-known rounds to come onto the market. The use case for this round was at one time as the go-to African plains cartridge and was used very effectively mostly against non-dangerous game animals. That said, to was more than capable of taking deadly animals and larger animals like elephants when utilized properly. Those days are all but gone now, at least from the perspective of its use for dangerous game like Lion Tiger, etc. 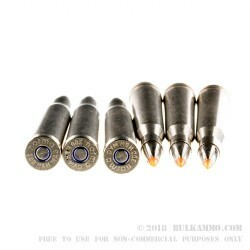 For now the minimum requirement in most African game reserves is the .375 H&H Magnum, though this round carries the torch for the classic magnum round and still has myriad uses around the world for larger game that you need a round you can 100% reliably trust the performance to take out an animal. The clear value of the round is its ballistics: 2880 fps velocity and 3315 ft. lbs. of energy at the muzzle. 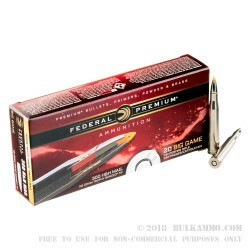 The Federal Premium ammunition is a legitimate loading of the most premium components on the planet, from the Normal brass to the Trophy Bonded Tip projectile. The nickel case plating and projectile plating offers significant reductions in corrosion concerns.